Oh, all you oversingers, divas and Canadian Idol hopefuls. You missed a master class in how it’s really done when Barbra Streisand hit the Bell Centre stage Wednesday evening for the fourth stop of a 12-night tour. In the course of a generous, almost epic performance – two and a half hours, not including intermission – the singer’s singer showed that, at 70, her impeccable phrasing and razor-sharp control are pretty much still intact. The excitement started rippling through the well-to-do crowd before Streisand even took the stage, as an opening montage tracing her growth for childhood to young pro led into an overture from Funny Girl. And suddenly there she was, singing As If We Never Said Said Goodbye. “Talk amongst yourselves, I’m getting verklempt,” she said mid-way through the song (students of Saturday Night Live will remember). From that point on, the show was, in a way, flawless – in part because even the flaws were planned in this tightly-scripted show. Guilty, supposedly sung in response to a fan’s request during an Ask Barbra Q&A session – as if the full orchestra was just going to wing it – was on the set list before the show. And so was I Finally Found Someone, at which Streisand feigned surprise and “struggled” to remember the song. But all eyes were on Babs and impatient for her to get back each time she ceded the spotlight. No one can own a room like that, and – pop star divas take note – no fireworks, fetish clothing, bumping-and-grinding choreography, obnoxious melismatics or any other cheap attention-grabbing stunts were used to pull it off. Never were. 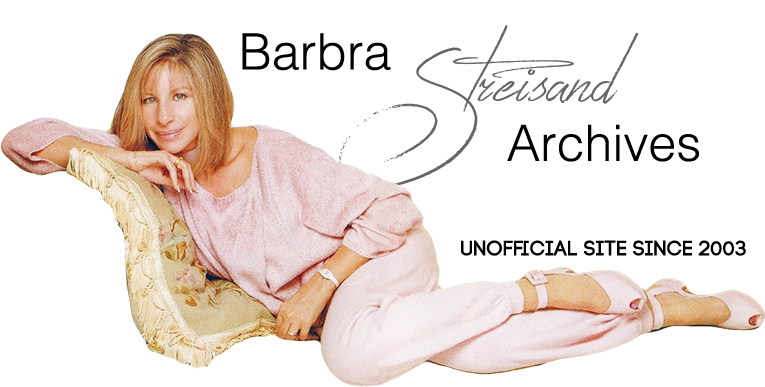 Streisand has always done it with elegance and a peerless voice. She is truly, it seems, the last of her kind. After a larger-than-life finale of the Leonard Bernstein ballad Make Our Garden Grow, featuring all the guest artists and the Montreal Choral Institute, and a haunting solo version of Some Other Time, Streisand brought out her sister Roslyn Kind. The two ended the night by reviving Streisand’s immortal moment with Judy Garland, a slow-burning 1963 duet blending Happy Days Are Here Again and Get Happy. It was the exact right ending to a night of show biz perfection. Accept no substitutes. This is my sixth time seeing (and hearing!) Barbra live and the second time in Montreal. It is surreal to have her perform in my hometown. I was going to go see the Brooklyn concert but my contact told me to «wait», something was going to be announced soon. You see, I was one of the very lucky people who attended the Village Vanguard concert in NYC a few years ago. And at the end of that mind-blowing evening I walked to the stage (what stage?) and noticed that Barbra had left her tea-filled paper cup on her stool. With «permission» from Sarah Jessica Parker (ok, ok, a wink) I snatched it up. I felt silly, guilty and happy. As the people were leaving the venue, a crew recorded on camera some of the comments from the people at the concert. They asked me to say a few words. I did and then I produced my cup and asked Barbra to forgive me for stealing it from her. Well, that segment ended up on the DVD of the show. My proudest Barbra moment ever! I had brought my cup to the show and a screen capture of the DVD with me holding it. Same red jacket (my “Barbra jacket” I call it). Barbra's assistant thought it was fantastic and funny and asked to borrow it for a moment. She left with it and headed backstage. Moments later she returned with my cup signed by the great one herself, in French : For Michel—Merci Barbra. How about that? And she signed inside the cup! That woman can do EVERYTHING! LOL. I felt faint. How he knew me or of me will remain a mystery. From the DVD? We talked a bit and then he headed backstage to start the show. He came out at intermission and told us to prepare our Kleenexes… it was going to be intense. And that there would be a surprise of immense significance which turned out to be an appearance (and duet with Barbra!) by Roslyn Kind. The evening was magical! Barbra asked me a couple of questions during the show, reacted to my reactions a few times and—as we were pleading for an encore, I pointed at her and showed her to her stool and mouthed : Now sit down and sing another song. She answered : “OK, then you want me to sit down and sing. I’ll do it. You know I can take orders really well,” and smiled at me. Oh boy! How does one forget such a moment? We witnessed a memorable performance. She spoke great French. And during the Q&A section she read the names in French of the people who had asked questions and her pronunciation was flawless. I was very impressed. ¨How does it feel being called a living legend?¨... ¨Well I like the living part of it…¨ That answer was hysterical. Just before Chris Botti started playing, she asked him: “Can you play in French?¨ Funny, unscripted moment. ¨How does it start?¨ It took a while before she got going and nobody cared. It was a great moment, one of those times when we love her even more. She is so relaxed now and seems to enjoy her time on stage. Mama looked REALLY proud when Jason sang. I would too. He was terrific. I have bought his album on iTunes and I like it tremendously. Damn, that family has talent! And Roz… it must have been daunting to revisit the classic Barbra-Judy duet, but she just killed it and, dear God, she exudes happiness. I feel very content this week. Mick Jagger never got his, but I sure got my satisfaction…! And it was so nice to follow Richard Jay-Alexander on Facebook and discover that he loved Montreal. All the reviews were stellar. The weather was gorgeous. The foliage so pretty. And I hope Barbra felt great being here. She certainly made us feel like we had been touched, once again, by the best sounding angel. P.S. The Brooklyn vintage film is particularly funny. I pray it ends up on the DVD coming our way. She was in great voice, natural and funny. A visit to Streisandland from her time in Brooklyn to today. A special visit with the landlady herself. The photo montage at the beginning was fantastic and the Funny Girl overture always works for me. A great orchestra conducted by Bill Ross and with Tamir Hendelman at the piano. I was very impressed with the Chris Botti segment. There is something there for future recordings….so many possibilities and so many great songs to be sung. I really liked "What'll I Do?" Wow! One of my favorite Irving Berlin songs. It was hard for me not to sing along, but I did it anyway—but pianissimo so as not to disturb the peace! Barbra ask Chris Botti just before his segment «Can you play in French?» and he did… LOL! The Hamlisch-Styne segments were great! The Gypsy medley was nice but it felt more like a preview. Barbra is sending out the clear message that she is determined to be Mamma Rose. I’m so glad she decided to choose the original movie version for the classic song “The Way We Were” (personally I prefer this wonderful orchestration to the pop version) and “Through the Eyes of Love” is such a nice song. I do hope she will record it on a future cd. “Ne me quitte pas (If You Go Away)” by Jacques Brel was her special gift to the Montréal audience. That was a very delicate and touching thing to do. Merci! The Ask Barbra section was ok— but this moment was hilarious: “Do you feel comfortable being called a living legend?” ... Yes as long as there is «living» in it..... LOL ! Every journalist I have read by now is saying that Jason has the timbre of Josh Groban, but I think he has more of a George Michael type of feel—in fact he has his own voice … nice, virile, vulnerable and strong at the same time. The duet was very charming. I don’t remember if I ever heard a mother and son duet … I’ve heard father and daughter (Frank and Nancy Sinatra), mother and daughter (Judy and Liza). So Barbra and Jason's duet is new, fresh and very touching to hear. While I’m in the family mood, what about this very exclusive duet with her half-sister Roslyn Kind? When I saw they were selling Roslyn Kind CDs in the gift shop I wondered why…Now I know. A surprise encore, the duet “Happy Days/Get Happy.” Maybe a duet with James Brolin is also possible in this tour. He made a record long time ago called James Brolin Sings. What a treat: Didn’t We, Lost Inside of You, Being Good Isn’t Good Enough, Nice ‘n Easy / That Face, Make Our Garden Grow, and Here’s to Life. My favorite moment was when she sang Leonard Bernstein "Some Other Time." Her rendition was simply perfect and exquisite. The last long note was divine. What a great artist, her phrasing and legato were refined! A real master class for young and future singers. The concert was long, classy, filled with music, emotions, nostalgia and magic moments! I saw and heard a Barbra Streisand more real, cool, funny, human and convivial! In two words… Simply Barbra ! P S: I had my Yentl CD, autographed by Michel Legrand while I was at the Village Vanguard show, andI brought it to this concert, too … Maybe one day I’ll get Barbra and the Bergmans to autograph it! …Oh well, some other time.